[Satnews] Parliamentarians and businesses visited Inmarsat to hear first-hand about the work they are doing to tackle the last mile problem. 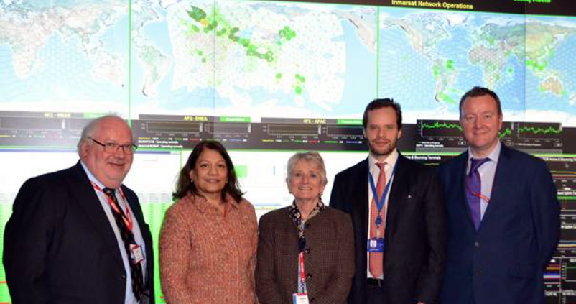 (L-R) Lord Harris, Valerie Vaz MP, Baroness Neville-Jones, James Cemmell, Chris Locke at Inmarsat HQ exploring more about the last mile problem. Photo is courtesy of Inmarsat. During the visit, which was chaired by Canterbury MP Julian Brazier, the group went on a tour of Inmarsat’s facilities and heard from Chris Locke who is the founder of Caribou Digital, a new organization dedicated to growing digital economies in an ethical and sustainable way in emerging markets. The group also discussed what can be done both in the UK and internationally to increase connectivity as 57 percent of the world’s population currently remains unconnected and in the least developed countries 90 percent of people are unable to get online. The visit was held at Inmarsat’s HQ in London and was arranged jointly by Inmarsat and the Industry and Parliament Trust (IPT) as part of the IPT’s Industry Visits Program.